The Current Explorer • A fact-finder dispatched by our readers’ curiosity. It responds to questions posed by members of The Current Plus. Riverfront cities San Antonio, Texas, and Chattanooga, Tenn., have made riverwalks and river parks central features of living. These are magnetic tourist attractions that draw thousands of visitors and anchor sustained commerce in both cities’ Downtowns. Lafayette’s also got a river — the murky sloth that is the Vermilion — but it doesn’t have a riverwalk like San Antonio or Chattanooga, or lots of other cities for that matter. Why, exactly, is that the case? This question probes a more aspirational curiosity: What would it take to have a riverwalk or at least a better public relationship with the Vermilion? The following is an attempt to answer that question — one posed and voted on by readers at The Current’s launch event in March. The historical answer to that question is relatively straightforward: That’s just how Lafayette developed. Since the platting of Vermilionville (Lafayette’s original name) about two miles northwest of the river it was named for, Lafayette’s city life has ignored — and even abused — the river. Jean Mouton founded the city away from the river. He and other plantation owners and farmers kept their land along the river because it was more valuable to them, a condition that sustained well into the 20th century. You can read more about the river’s history here. 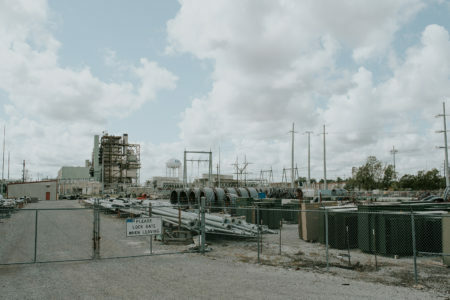 In Lafayette, private development has favored residential construction along the Vermilion River’s banks, leaving very little access available for public development like parks or commercial development like shopping districts, the sorts of things you see in San Antonio and Chattanooga. Both Chattanooga’s and San Antonio’s river walks were the result of concerted initiatives. It’s really a matter of choice and incentive. Lafayette decided otherwise. That’s a drag. What can we do about it? There’s actually some momentum within city government to provide more public access to the river. Aside from stray launches scattered about the bayou, there is about three-quarters of a mile of bank (1.5 if you include both sides) between the University Avenue and Surrey Street bridges that, for the most part, is owned by public agencies. A big swath of that is Heymann Park, which sits across the river from Vermilionville. There’s just over a mile of public land along the river near Vermilionville. That’s a great opportunity for riverfront development. 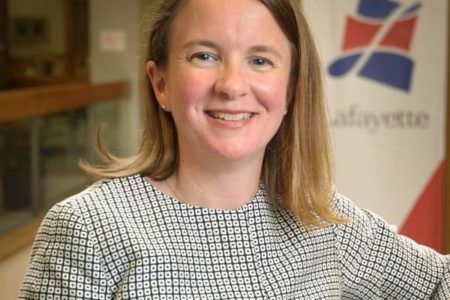 Cathie Gilbert, a city planning manager, says there’s about $75,000 in the city’s budget for designing connectivity between Heymann Park and Vermilionville. That effort stems in large part from concepts developed by the Evangeline Corridor Initiative, the city committee that works on planning strategies in the neighborhoods most likely to be impacted by the I-49 Connector. Check out the design manual that the ECI developed for the Vermilion Recreational District to see ideas like a pedestrian bridge. River access is a central feature of its revitalization strategy. But isn’t the Vermilion really dirty? That’s why no one uses it, right? Not exactly. 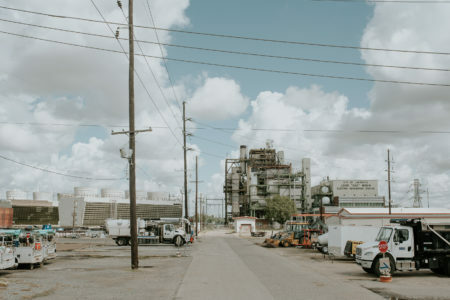 Around the 1960s and 1970s, the Vermilion was America’s most polluted river, according to David Cheramie, CEO of the Bayou Vermilion District, the agency charged with cleaning and maintaining the river. That wasn’t necessarily unique to Lafayette. This was the era of rivers “catching on fire,” Cheramie says. Pollutants in the Vermilion were largely the result of agriculture. And that remains the case. Farms up stream dump fertilizer and waste into the river. People still have a nasty habit of littering. For the most part, BVD’s personnel have improved the river — even if they occasionally grapple a cow out of the water. Today, the Vermilion is safe for secondary contact. You can boat in it, fish in it and eat the fish you catch. Still, there’s a widespread perception that the river is unclean. No doubt that has to do with its muddy tint. That’s not gonna change. So how exactly did San Antonio and Chattanooga get their riverwalks? Can’t we do that? There are some striking parallels between those cities and Lafayette. And indeed it’s worth consulting their histories to consider how we could approach the task here. The San Antonio River Walk — also called the Paseo del Rio — took shape in the early 20th century. The catalyst was a major flood of the San Antonio River in 1921, which killed 50 people. Dams were built to control the river years later, setting the stage for the riverwalk to take shape. A special taxing district and funds from the New Deal paid for an ambitious design, a depressed walking district below the city’s downtown plazas that wasn’t altogether popular at first. Once the infrastructure was in place, a prominent hotelier plonked some shops down to attract commerce. It worked. For the next 100 years, the district’s prosperity ebbed and flowed. Now a 13-mile feature — about three miles course through Downtown San Antonio — the San Antonio River Walk is the city’s signature tourist attraction. Sorry, The Alamo. How does this apply to us? Well, Lafayette is currently grappling with how to deal with its own flooding problem, in case you hadn’t heard. While there’s not an obvious way that a river park could solve it, there’s a thought process out there that linear parks along the river could double as flood buffers. Beaver Park already does that to an extent. It’s certainly fair to say that we’re experiencing a sea change (river change?) in how we conceptualize our relationship to the Vermilion River. That could preface the ambition needed to get something like the San Antonio River Walk done. Chattanooga is frequently praised for its progressive and daring approach to urban development. The Tennessee River Walk started all that. It was conceived in the 1980s as a way of breathing life into Chattanooga’s deflated downtown. The city was left for dead by a collapsed textile industry. It’s said that air pollution was so bad in the 1970s that cars kept their headlights on to cut a line of vision through the smog. A nonprofit seeded with millions from private donors bought property around the river and anchored public-private partnership efforts. Several adaptive reuse projects converted dilapidated buildings from the 19th century into brewhouses and shopping malls, with the Tennessee Aquarium right on the banks of the river becoming the centerpiece. A state highway was ripped out to connect the aquarium with the river. Today the Tennessee Riverpark, as it’s called, runs about 13 miles and serves as a connector between Downtown Chattanooga and the city’s outdoor recreation. How does this apply to us? For starters, the “polluted town on the brink of economic despair” doesn’t exactly describe Lafayette, but it has a ring of familiarity. That’s really a matter of degree. We’re years into efforts to clean up our environment but in relative infancy when it comes to reinvesting in our urban core. In a broad sense, we’re not terribly different from the Chattanooga of the early 1980s. 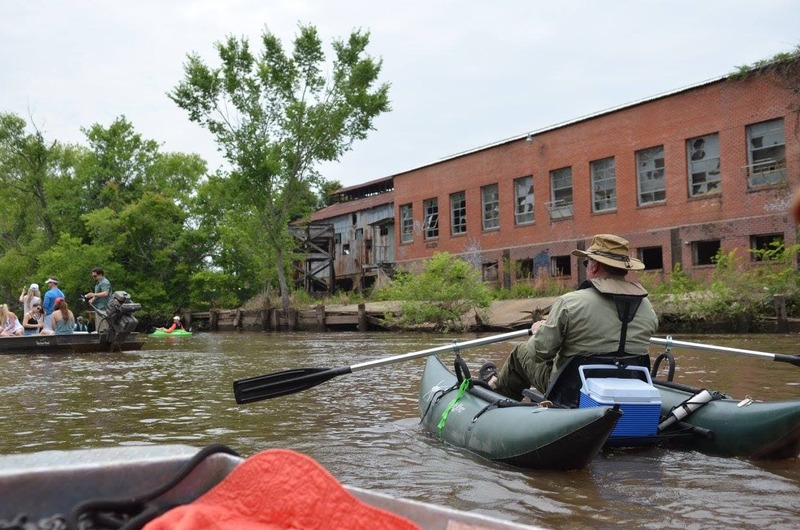 Kayakers paddle past the old Trappey’s canning plant on the Vermilion River during the Bayou Vermilion Boat Parade. Lafayette has dipped its toes into the public-private partnership approach to development. And there are opportunities for adaptive reuse in that stretch by Vermilionville mentioned above. While still privately held, the old Trappey’s plant has long been tagged in adaptive reuse fantasies. It figures into the ECI design manual as a “significant building,” i.e. an asset to future development. 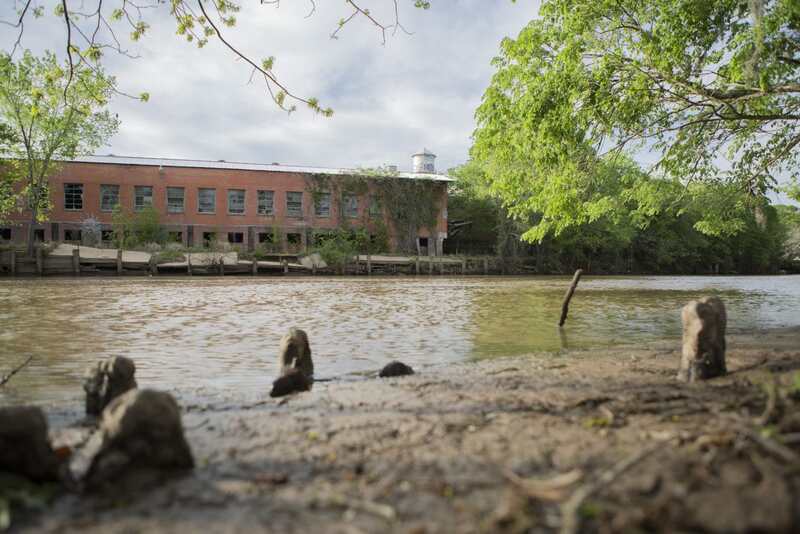 It’s not out of the question that the old canning factory — once a major polluter on the river — could be part of a revitalization effort. I contacted the ownership group that acquired the Trappey’s plant in 2015, but could not reach anyone for comment. I’d argue that the city is well-positioned to better connect itself with the river. Recent community efforts like the Bayou Vermilion Boat Parade or the Vermilion Voyage have put the river’s recreational and civic value on display. I’m a cautiously optimistic guy by nature, so it would be a stretch to suggest that we’ll have something akin to the San Antonio River Walk any time soon. The good news is that our approach doesn’t have to match that ambition to be transformative. There is a 1984 Bayou Vermilion Master Plan containing visions of us swimming in the bayou by the early 1990s, plans for a “mysterious” Indian [sic] outpost, and riverwalk-type dreams for the cannery property. Let me know if you’d like a copy.